packed and sent off to a customer in Europe or the USA. She has mastered the intricate art of hand varnishing the instrument having worked as a violin maker for the past ten years. She is also one of the few who have retained their jobs at this factory where during the past 10 years the workforce has dropped from 140 to 14 with orders from their traditional export markets in the west drying up as cheaper versions of these musical instruments flooded the world market. 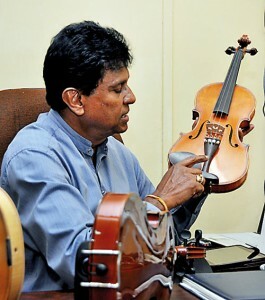 “We were exporting close to 2,000 instruments, mainly violins as well as violas, cellos and double basses to our clients in Europe and America annually but starting around 2005, cheap Chinese-made instruments began flooding these markets and our orders began to drop sharply,” said Palitha Ganegoda, the owner of the Ocean Music Company that manufactures the instruments. The art of making these string instruments is a highly specialised process. Only maple and spruce, wood categorised as soft timber imported from Germany is used to carve out the body of the instruments while ebony imported from India is used for the pegs, chin rests and tail pieces. All the instruments are made to Stradivarius measurements, the internationally accepted standard for string instruments named after the legendary Italian violin-maker Antonio Stradivari. “My workers were trained by two Koreans and a person from the Czech Republic whose family had for several generations manufactured handmade violins. He guarded the secret of hand varnishing of the violins jealously and only disclosed the method a day before he left Sri Lanka saying he was highly impressed with our local workers, especially their ability to grasp new skills, ” Mr. Ganegoda said. They in turn have mastered the elaborate process involved in making these musical instruments. “A handmade violin can take as much as a month to make and I sell each for around Rs.75, 000,” Mr. Ganegoda said. she had bought in the USA for close to Rs.180,000 which had been damaged while it was being transported here and she wanted it repaired. On close inspection of the instrument I realised it was one that had been made at my factory,” he said. Since then, the lady has become a regular client of his, he smiles. Mr. Ganegoda began his business way back in 1996 initially as a Board of Investment registered company with a Korean partner but later bought over its sole ownership. He also later altered his agreement with the BOI to sell his goods locally as the overseas demand dwindled. “I had to scale down my operations as the demand lessened which meant laying off staff and selling off some of my property which I had purchased hoping to expand the business. Some of my workers who had become expert violin makers today work at construction sites and engage in other jobs. It is a very sad situation,” Mr. Ganegoda added. 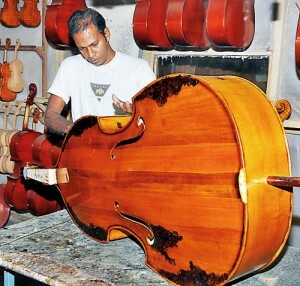 Sunanda Perera who has worked at the factory for over ten years is an “all-rounder” when it comes to violin making. “I can make an entire violin on my own now,” he said proudly as he worked on a cello, polishing it to ensure that the wood was of the right thickness. “A master mound is used first to cut the wood to the shape and size of the instrument being made. This is followed by the careful polishing of the wood to ensure the proper thickness is maintained. In a violin, the thickness of the instrument varies at eight different places and as the instrument is being polished, a measurement has to taken from time to time to ensure that the right thickness is maintained,” Perera explained. 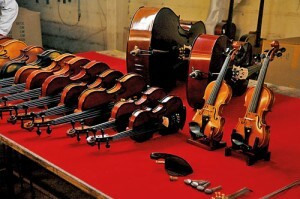 While a handmade violin is not within the reach of many given its high price, cheaper instruments are made where machinery is used in the manufacturing process. “There are many schoolchildren who want to learn to play a musical instrument but they cannot afford to spend a lot on a violin or a viola. So we manufacture cheap instruments so that children who are talented can own an instrument and develop their skills,” he added. For now, Mr. Ganegoda and his workers are concentrating on making a few handmade instruments to meet the orders which come their way from time to time. “There are some foreigners who learn about us and place an order. In Sri Lanka we have members of the Symphony Orchestra of Sri Lanka as well as some leading musicians buying from us. But it is an uphill task to keep this business going,” he says. So while a story about violin makers should ideally be music to the ears, for these workers things have hit a low note with uncertainty regarding the sustenance of their livelihood in the years to come.